Sheldon is an area of east Birmingham, England. Historically part of Warwickshire, it is close to the border with the Metropolitan Borough of Solihull and Birmingham Airport. 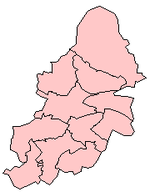 Sheldon is also one of the 40 electoral wards in Birmingham, and one of the four wards that make up the council constituency of Yardley. It covers an area of 2.3 square miles (6.0 km2; 1,500 acres). Areas covered by the ward are Lyndon Green, Well's Green, Sheldon itself and part of Garrett's Green. Sheldon was mentioned in the Domesday Book as Machitone, meaning "Macca's farm". A Mackadown Farm existed in the area until the First World War, however, it is only remembered through Mackadown Lane, a residential road. The suburb is home to the 300 acre Sheldon Country Park, a popular local attraction. According to the 2001 UK Census there were 20,129 people living in 9,140 households in Sheldon with a population density of 3,481 people per km² compared with 3,649 people per km² for Birmingham. Sheldon has a low percentage of ethnic minorities in its population with only 5.9% (1,195) being of an ethnic minority compared with 29.6% for Birmingham in general. The population had increased to 21,817 at the 2011 Census. Housing in the area primarily dates back to the 1930s. The area benefits from Sheldon Country Park which is adjacent to Birmingham International Airport and is served by numerous shops and businesses situated along the busy A45, Coventry Road. This road acts as one of the city's primary gateways from Coventry. There are two secondary schools serving the area: Cockshut Hill Technology College and King Edward VI Sheldon Heath Academy. There are five primary schools, one of which is Roman Catholic. Sheldon Library also serves the area. As of 2005, the three councillors representing Sheldon Ward on Birmingham City Council are Sue Anderson, Paul Tilsley and Mike Ward, all of the Liberal Democrat Party. The ward has adopted a Ward Support Officer. Ian Smith, town planning expert, also lived in Cranes Park Road in the 1960s and '70s. Rev. Thomas Bray, founder of the Society for the Propagation of Christian Knowledge, was Rector of Sheldon. Howard Brown, branch manager for the Halifax bank, won a staff competition to appear in their advertisements, was born and brought up in Sheldon. Kevin Warwick, professor of cybernetics lived there in the 1970s. In the latter part of this time he studied at Aston University. Andre Marriner, a Premier League football referee. 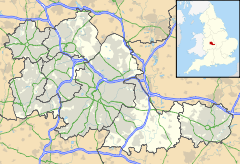 Wikimedia Commons has media related to Sheldon, West Midlands. This page was last edited on 1 November 2018, at 22:09 (UTC).